The House Committee on Oversight and Government Reform highlighted wasteful federal spending on Thursday, holding a hearing that cited numerous examples of the practice, but few successes in eliminating it. The hearing led with testimony from Senate Homeland Security and Governmental Affairs Committee Chairman Tom Carper (D., Del.) 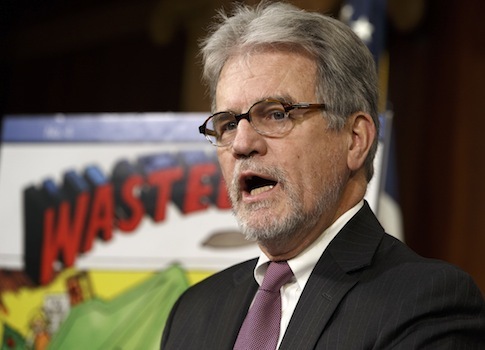 and Ranking Member Tom Coburn (R., Okla.), whose recent release of the 2013 Wastebook identified over $30 billion in frivolous government spending. Coburn said the problem of government waste is not caused by a lack of bipartisanship in Washington. "My take is we get along too well," he said. "We have presidents that come and go, Congresses who come and go, and we still have government waste. Why is that?" "The problem isn’t that we don’t know what the problem is," Coburn said, "it’s that we don’t act on the problem." The hearing exposed a lengthy list of examples, including $9 billion in tax breaks and loans to the wealthy that saw farm subsidies going to Ted Turner, Jon Bon Jovi, and former NBA player Scottie Pippen. Thomas Schatz, the president of Citizens Against Government Waste, testified to the numerous overlap in federal programs. "Analysis is virtually non-existent" for the 47 job training programs across nine agencies, he said, which cost $18 billion in fiscal year 2009. Thirteen agencies administered 209 science, technology, engineering, and math (STEM) programs totaling $3.1 billion in FY 2010, though the United States still lags behind other countries in the STEM field. "Most absurdly," Schatz said, there are 56 programs from 20 different agencies devoted to promoting financial literacy "intended to improve the fiscal acumen of the American people." Fifteen of those programs cost $30.7 million in FY 2010. "While it would be funny if it wasn’t so sad a government that itself is going broke should not [be] spending any money trying to teach others how to balance their checkbook," Schatz said. "We have 679 renewable energy programs from 23 different agencies costing $15 billion a year," Coburn said. "Can anyone logically say why we would need 679 programs?" Coburn said the federal government has "grown so massive" that only one department—the Department of Education—actually knows how many programs it runs. "Before you can fix anything you have to know what’s there," he said. "We haven’t looked." "The problem is us," Coburn said. At one point in the hearing Rep. Jackie Speier (D., Calif.) held up a piece of plumbing pipe that she said cost her $1.41 at a hardware store. The Pentagon paid a contractor $80 for the same part, she said. "It’s outrageous," Speier said. "We have a Defense Logistics Agency, it’s our hardware store. I hope to God we do something about this." A report released by the National Taxpayers Union (NTU) and U.S. PIRG found that ending excessive inventory and obsolete spare parts for the military could save $3.9 billion. Coburn said there is a minimum of 20 percent waste in the Pentagon’s budget, largely because the DOD is unable to audit its own contracts. "It’s a mess," he said. "You cannot manage what you cannot measure. The Pentagon can’t hardly measure anything." Rep. John Mica (R., Fla.) lamented Amtrak’s recent $72 million loss on food services, and a ballooning Transportation Security Administration (TSA) that now has 15,000 administrators and 66,000 employees. He also referred to his attempts to close unused, vacant federal buildings that cost taxpayers $1.5 billion a year. Mica has held hearings in empty government warehouses in Washington, D.C. to demonstrate his point, prompting the GSA to put some properties up for sale. "You gotta just keep going after the bastards until you’re successful," Mica said. "I don’t know what else you can do." The hearing did identify several small victories in curbing government waste. Rep. Tammy Duckworth (D., Ill.) said she was successful in saving $82 million by returning the military to a single camouflage pattern after offering an amendment to the National Defense Authorization Act. The Ultra-Deepwater Natural Gas and Petroleum Research program, a project that seeks to expand petroleum production, was also cut in last month’s bipartisan budget deal, saving taxpayers $50 million. That was just one of the 65 recommendations in the joint NTU and U.S. PIRG report that identified $500 billion in savings over 10 years. "That’s one down and 64 to go," Brandon Arnold, vice president of government affairs for NTU, said. "There’s a lot of work to be done." Mica said the General Services Administration (GSA) scandal last year where hundreds of thousands of taxpayer dollars were wasted on lavish conferences in Las Vegas has allowed Congress to target other agencies. "I have to give most credit to the guy in the hot tub—the GSA guy in the hot tub," he said, "because he made it go viral." Mica recently issued a report that found the government could save $500 million a year by cutting conference spending at the IRS, GSA, VA, and DOD. "It’s not hard," Coburn said. "Low hanging fruit, it’s all over but it requires work. It means we have to move it through the process." Chairman Darrell Issa (R., Calif.) said he would guarantee a vote on any bill addressing government waste in his committee. "There’s a lot more than we can do," Issa said. "We will, in fact, move what you move, if you two [Coburn and Carper] can agree to it, because that’s the beginning of chipping away $1 billion at a time." Carper said cutting waste is a bipartisan issue, and Republicans and Democrats alike decried profligate spending during the hearing. "The key is to find that 80 percent that we agree on—all of us," Carper said. "It’s about perspective," Coburn said. "What would you do if it was your money rather than somebody else’s money? "And that’s the problem, we don’t treat it as our money." This entry was posted in Issues and tagged Government Spending, Government Waste, John Mica, Tammy Duckworth, Tom Carper, Tom Coburn. Bookmark the permalink.